Another Beautiful Day in Paradise. The blade/bicycle started off at around 65 degrees and ended up around 75 degrees. Pretty close to perfect weather. Absentees Glenn & Sandy, Carol J, Dee T, Ken & Vivian and Roy H came. Welcome all. Bayshore Blvd and the adjacent new sidewalk were almost completed and Main St. in Safety Harbor had a big street sale so we headed that way and skipped the South Trail. Bayshore Blvd did have a short terrible messed up area and a few turned around there. They did ~9.6 miles. 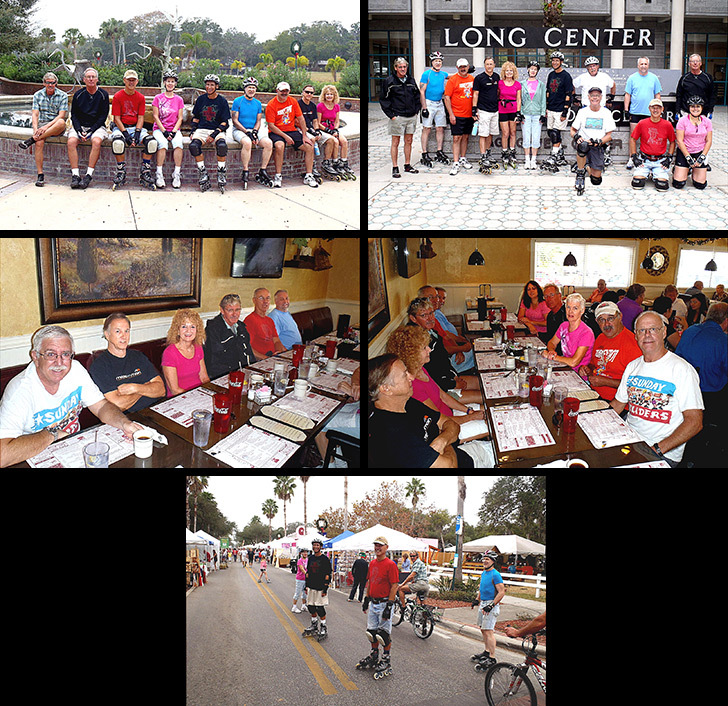 The remaining took a rest at the Safety Harbor fountain and then did the Main Street sale. They fortunately also found a way around the messed up area on the way back and did 11.5 miles. We had 5 bicyclists out of the group of 13. Denny I, Monika R, Andrew F and Carol J have become Web Site Sponsors and Email recipients for 2013. Thanks for your support. We Brunched at the Sunset Grill as planned. We got right in and seated at a long table. Service started off a little slow but we did manage to get in and out within an hour. We had several food ratings and finally decided upon 9.327.